The New York Academy of Art is pleased to announce its participation in Art Southampton for the third consecutive year, presenting an exhibition curated by renowned artist April Gornik. As a visiting critic, lecturer and role model to Academy students and alumni, April represents all that the Academy aspires to: brilliant craftsmanship in the service of progressive representation. The selection of work reflects the range and complexity of the Academy’s philosophy that a rigorous technical training paired with active critical discourse empowers an artist in the pursuit of vital, contemporary art. Featured artists include James Adelman, Tamalin Baumgarten, Nicholas Borelli, Dina Brodsky, Garrett Cook, Joshua Henderson, Alexis Hilliard, William C. Logan, Elisabeth McBrien, Gary Murphy, Nicolas V. Sanchez, Buket Savci, Sarah Schlesinger, Stephen Shaheen, Chie Shimizu, Krista Smith, and Moses Tuki. A highlight of the Academy’s presentation this year is Off!! 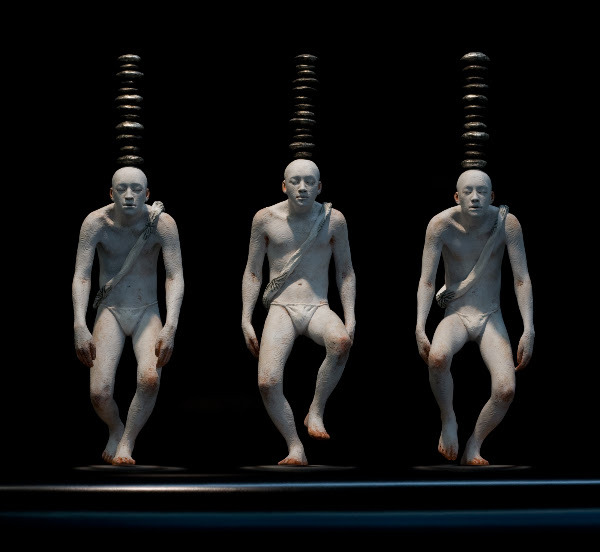 !, a sculpture by Academy alumnus Moses Tuki (MFA 2015), which will be exhibited at the entrance to the fair. 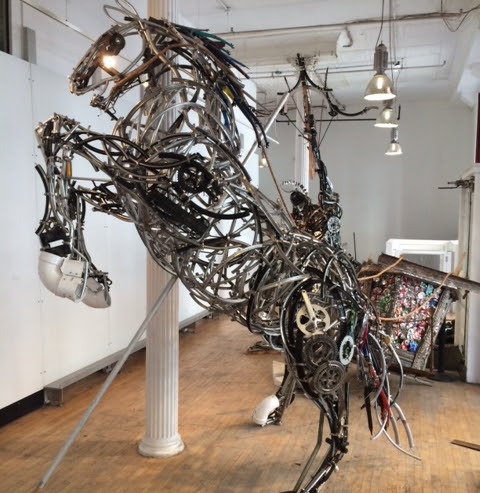 Fashioned from a framework of conduit pipes and thousands of bicycle parts collected throughout New York City, the giant horse stands over ten feet tall and twelve feet long. In a feat balance and tension, each piece of the sculpture - bicycle wheels, gears, and frames - is held together solely by metal clamps. Please join David Kratz and April Gornik along with exhibiting artists for a tour of the show, cocktails, and conversation on Friday, July 10, at 5:00pm. A portion of sales will go directly to scholarships for Academy students. Generous support is provided by Cadogan Tate. To learn more about the Academy’s exhibition program, please visit our website. Copyright © 2015 New York Academy of Art, All rights reserved. You are receiving this email because you're a valuable member of the Academy community. The marvelous folks at Modern Luxury chose Art Southampton exhibitor FP Contemporary artist Dirk De Bruycker's "Crown" (above) to kickstart their Beach Issue action. Check out the highlighting here. And don't forget to check out the two-page Art Southampton spread while you're there! 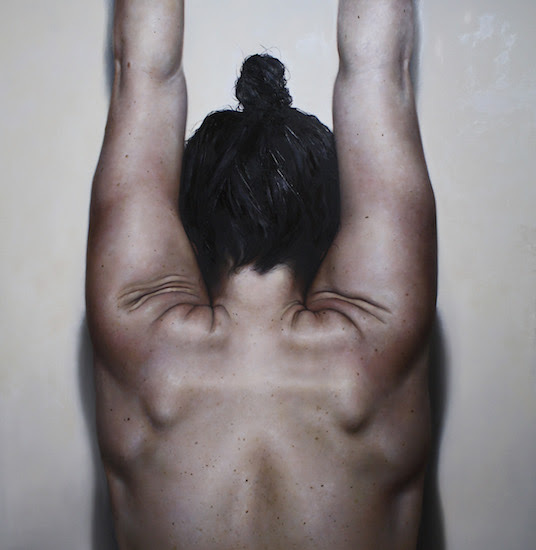 ArtFix Daily Chimes in on the 4th Annual Art Southampton! The awesome folks at ArtFix Daily chime in on all the haps to come at the 4th Annual Art Southampton -- including the move to the beautiful Novas Ark Project. 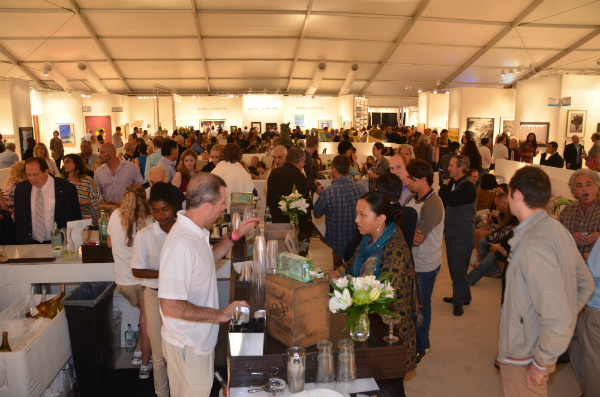 (Long Island, NY) Announcing new dates and a prominent new location on the grounds of Nova’s Ark Project for its fourth edition, Art Southampton has cemented its status as the premier contemporary and modern art fair in the Hamptons, offering the highest quality works of art from the 20th and 21st centuries. The 2015 edition also will incorporate design and the decorative arts. Art Southampton will open Thursday, July 9th, with a two-tier elegant VIP Preview benefiting the Parrish Art Museum and Southampton Hospital, sponsored by Christie’s International Real Estate, GRAFF Diamonds, and Ruinart Champagne. The VIP Platinum Preview will provide prominent collectors, curators, art advisors, architects, designers and decorators the First View and opportunity to acquire the finest blue chip modern & contemporary works of art from the emerging, mid-career cutting edge, Post War and Pop eras, with a focus on design and functional art. The fair also will highlight some of the East End’s most prolific past and present artists. LUXE Interiors + Design joins Art Southampton as the fair’s Design & Media Sponsor, ensuring the strongest participation from the design community with the creation of LUXECANVAS Design Ambassador Program, spearheaded by LUXE Editor In Chief, Pam Jaccarino. Christie’s International Real Estate will host an on-site booth, presenting international luxury residential real estate offeringsthroughout the duration of the fair. A robust event schedule will be available for the enjoyment all VIPs, including on-site cocktail receptions with artists and book signings, as well as daily scheduled private tours of some of East End’s leading artists’ studios and collector homes. Art Southampton offering the highest quality works of art from the 20th and 21st centuries. Photo Credit: Art Southampton. The internationally acclaimed New York Academy of Art, of which Andy Warhol was among the original founders, returns for the fourth year with an exclusive relationship with Art Southampton. Renowned artist April Gornik will be the guest of honor as she curates an exceptional exhibition of alumni works. Award winning LaGuardia Design will design the Art Southampton Sculpture Garden and main entrance of the pavilion. LaGuardia Design actively pursues an interest in how elements of the native landscape, existing topography, and neighboring influences help define the character of each site, and look to unify the landscape into a cohesive bond by firmly connecting architecture and site. Art Southampton will open Thursday, July 9th, with a two-tier elegant VIP Preview benefiting the Parrish Art Museum and Southampton Hospital. Photo Credit: Art Southampton. Art Southampton has become the favorite Hamptons destination for numerous museum and young-collectors groups, including Whitney Contemporaries, Museum of Modern Art Junior Associates, Metropolitan Museum of Art, Columbia Alumni Arts Patrons, Guggenheim Museum’s Young Collectors Council and members of the Museum of Art and Design, The Contemporaries, New Museum of Contemporary Art, National Academy of Design, Brooklyn Museum, Jewish Museum, Whitney Museum of AmericanArt, The Parrish Museum, Smithsonian Cooper-Hewitt, East End Arts Council, Miami Art Museum, National Academy of Design, Peconic Land Trust, Pérez Art Museum Miami, Norton Museum of Art, Yale University of Art, Princeton University Art Museum, Islip Art Museum and ArtTable, among many others. Art Southampton will once again organize scheduled events and complimentary charter bus service for museum and collector groups out of New York City. 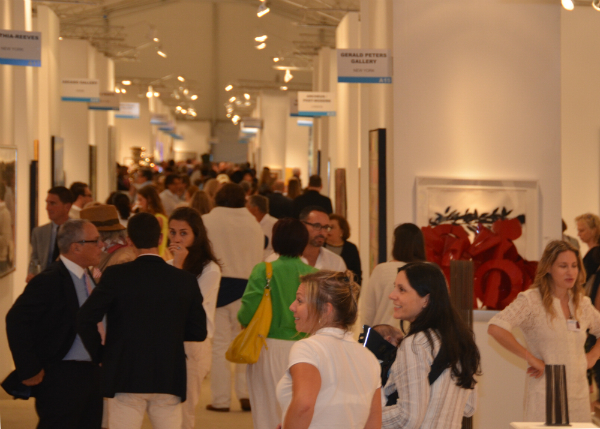 The 2015 edition of Art Southampton also will incorporate design and the decorative arts. Photo Credit: Art Southampton. Last year’s Art Southampton fair set a new standard in luxury presentation and attracted top collectors, cultural leaders and philanthropists of the East End. During the course of the five-day fair, a record 21,000 collectors, art enthusiasts, curators and influential attendees visited the luminous 100,000 square-foot pavilion. Art Southampton, Christie’s International Real Estate, GRAFF Diamonds, Ruinart Champagne, and participating galleries invite Platinum VIP cardholders and accredited members of the press to experience an exclusive first view of the highly anticipated Art Southampton fair with a reception benefiting the Parrish Art Museum and the Southampton Hospital. Complimentary cocktails and hors d’oeuvres will be served. This “can’t miss” event is the first opportunity to acquire the finest investment quality pieces of modern and contemporary art and design from the 20th and 21st centuries prior to the fair’s opening to the public on the following day. By Invitation Only! Thursday, July 9 | 7:30 – 10pm: The preview evening continues for all Art Southampton VIP cardholders. Friday, July 10 | 2 – 2:30pm | Café: A unique artist or collection of works, showcased at Art Southampton, will be highlighted. Friday, July 10 | 3 – 3:30pm | Café: Experts discuss why it’s important to protect your collection and the necessary steps to take. Friday, July 10 | 4 – 4:30pm | Café: Experts explore art market trends and the driving forces behind the growth. 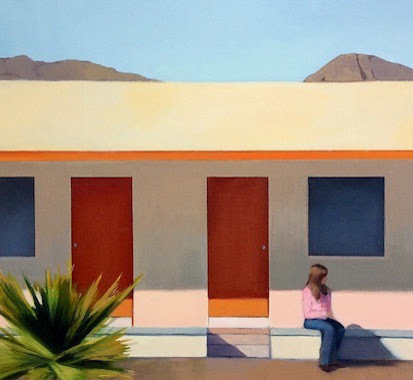 Friday, July 10 | 5pm: Academy President David Kratz along with April Gornik invite collectors and patrons to meet with featured Academy artists for cocktails and conversation while enjoying an exhibition of their work. Saturday, July 11 | 2 – 2:30pm | Café: A unique artist or collection of works, showcased at Art Southampton, will be highlighted. Saturday, July 11 | 3 – 3:30pm | Café: Experts analyze art investment trends as they relate to the contemporary art market. Saturday, July 11 | 4 – 4:30pm | Café: Experts share collecting strategies for emerging and experienced buyers. 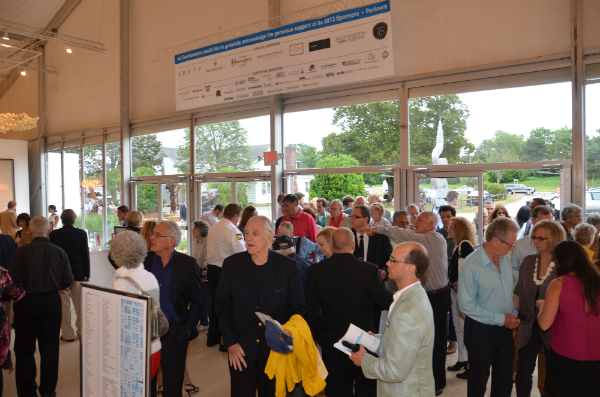 Saturday, July 11 | 6:30pm: This annual event brings together almost 1,000 artists, philanthropists, business leaders, and world guests in support of the Parrish Art Museum. Requires ticket purchase. For more information or to purchase tickets, please call 631-283-2118 x 150, or e-mail benefitevents@parrishart.org. Sunday, July 12 | Noon | VIP Lounge: Art Southampton and the Parrish Art Museum invite their Midsummer Party Host Committee and the Parrish Contemporaries Circle Steering Committee to enjoy a delicious brunch in Art Southampton’s VIP Lounge while mingling with friends and colleagues, Art Southampton dealers and Fair Director Nick Korniloff. By invitation only! Sunday, July 12 | 2 – 2:30pm | Café: A unique artist or collection of works, showcased at Art Southampton, will be highlighted. Sunday, July 12 | 3 – 3:30pm | Café: Experts investigate the influence of technology on today’s art market. Sunday, July 12 | 3pm – 5pm: Jules Feiffer will sign copies of Out of Line: The Art of Jules Feiffer by Martha Fay with a foreword by Mike Nichols. Published by Abrams, New York. It is a beautiful coffee table book,’” showcasing 40 years of wonderful cartoons for the Village Voice, the art from his many children’s books ( e.g., The Phantom Tollbooth), and excerpts from his movies (“Carnal Knowledge”) and his plays (“Little Murders”). It also features drawings from his recent graphic novel ( Kill My Mother), Original Village Voice cartoons and dancer drawings will be featured. Sunday, July 12 | 4 – 4:30pm | Café : Experts discuss the times and circumstances that require an accurate and recent art appraisal. Monday, July 13 | 1pm & 3pm: Enjoy a complimentary tour of the fair with an independent curator or art advisor. Presented by Art Southampton and One Art Nation | July 10–12, starting at 2pm daily in the Café | FREE for fair visitors (schedule subject to change). The Art Symposium brings together leading opinion leaders and industry experts to speak on a range of topics covering everything from artist spotlights to panel discussions on contemporary art market trends. Whether you are a first time buyer, established collector, industry professional, or simply have a passion for art, our expertly curated program is both diverse and engaging. The New York Academy of Art, the country’s preeminent school of figurative and representational painting, drawing and sculpture, is thrilled to present an exhibition of work curated by the renowned artist April Gornik. As a visiting critic, lecturer and role model to Academy students and alumni, April represents all that the Academy aspires to – brilliant craftsmanship in the service of progressive representation. Art Southampton is operated and produced by a partnership consisting of art and media industry veterans Nick Korniloff, Mike Tansey and Brian Tyler. The ownership team also produces Art Miami (26th edition), CONTEXT and Aqua, all taking place during Miami Art Week (December), Art Wynwood (February), CONTEXT NY (March), Art New York (May) and Art Silicon Valley / San Francisco in October. Koons Bilbao! Kapoor Versailles! Art Southampton! Yes, among the select summer art world highlights cited by the ever-knowing folks at New York Magazine's Vulture, are Anish Kapoor's exhibition in the Gardens at Versailles, the Jeff Koons retrospective at Guggenheim Bilbao and Art Southampton's shift to the pastoral grounds of the Nova's Art Project in Bridgehampton. The highlighting's entitled "SEEN's Cost-is-No-Cost Summer Art World Itinerary" and it can be gleaned in full right here.